If you’ve never traveled outside of the country with your family before, you should know that traveling internationally is not exactly the same thing as traveling domestically. Since you’re leaving United States borders, there are more hoops to jump through in contrast to if you were just flying to another American city. Here’s something that many people don’t know about: just because it hasn’t expired doesn’t mean it’s valid. The majority of countries require your passport to be valid for a minimum of six months after your date of return. The reasoning for this is because if there are any issues and you aren’t able to leave, they don’t want your passport to expire. The U.S. State Department recommends that you be on the safe side by having your passport be valid for at least nine months after your return date. The good news is that renewing your passport is a simple process. While it can take up to six weeks to have it process, you can pay a little extra for an expedited service to have it done in as little as two weeks. It’s always a good idea to have foreign currency in your wallet when you arrive at your destination; you shouldn’t be overly dependent on your credit card(s). The simplest way to get currency of the country you’re traveling to will be to use a money exchange service where you can exchange American dollars for the foreign currency for a small fee. The one big downside to using credit cards internationally is you’ll almost certainly have to pay a fee that can be three percent per transaction or more. If you don’t want to pay this kind of fee with each transaction, you won’t have to so long as you are very selective about the credit card that you use. In some, a small handful of credit cards won’t charge any fees for international transactions at all. Examples include the Platinum American Express and the Chase Sapphire Preferred Card. You should get vaccinated before leaving for your trip for the simple reason that it’s always better to be safe than sorry. Research the health information of the country that you’re traveling to through the Centers For Disease Control and Prevention, which will also list out any vaccination recommendations for that country. As a golden rule, you’ll want to get vaccinated at least one month before you depart, and six months would be better. As another golden rule, avoid traveling to any countries that have rampant diseases. If you do have to travel to such a country (maybe you’re moving there or you need to for work-related purposes), then you will need to speak with a medical professional beforehand. Travel insurance is another example of something that’s you should invest in to be safe rather than sorry. There are a myriad of things that could possibly go wrong on a trip, ranging from an emergency evacuation to a medical emergency to losing particular items or having things stolen. Assuming you’ll want to be financially covered in those kinds of instances, travel insurance will most definitely be a wise investment. Just be sure that you read the fine print before you sign up for a plan, because certain travel insurance plans will have a lot of exceptions and won’t be worth your money. 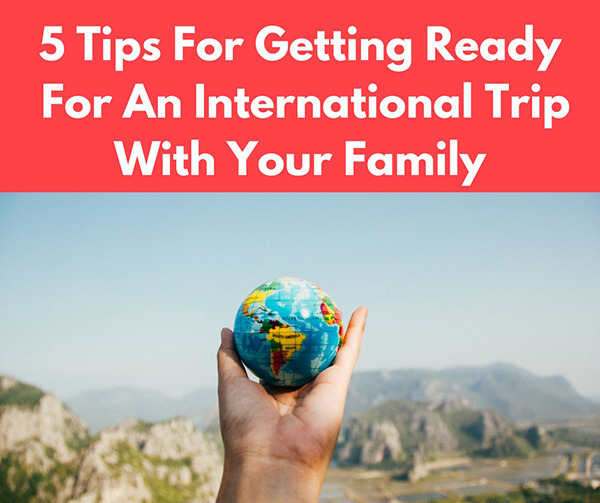 Traveling internationally for the first time with your family will require you to take a few extra steps in contrast to traveling domestically, but honestly, it’s not as intimidating as it sounds. If you’ve already done a fair amount of traveling within the United States already, the process of packing up, boarding the plane, and then landing and finding a taxi or rental car should seem largely familiar to you.